I understand many of you are eagerly awaiting information and assets coming out of GDC, and it’s probably challenging trying to be patient during this time! Right now I’m sitting in on one of the presentations we’re doing here, but I have a few minutes to spare, so please allow me to take this opporunity to inform you guys about what we’re doing at GDC and what you can expect coming out of the show. Right now we are inviting press to exclusive presentations here in San Francisco, and we’re showing them roughly 15 minutes of actual gameplay. That’s all in-game footage, so it’s an exciting time for us. The journalists are taken through some of the core features of the game, and they get to ask Ragnar Tørnquist and Martin Bruusgaard questions afterwards. Just as we stated before the show, what we’re doing is showing this to the press first before releasing the information and assets to the public after GDC. This is a strategic decision as we want to give all journalists the opportunity to release their coverage at the same time, and we want to give them enough time to prepare that coverage. This is a common publicity strategy, especially for games that are this early in the ‘PR phase’. If not, the journalists who were lucky to be here first would have a headstart over the other journalists, which could severely lessen the impact of our reveal. The embargo date for the press is 23rd of March. That’s when they are allowed to report from the presentations and publish the assets. You should also note that there will be a staggered release of assets, meaning some assets will be made available on the 23rd, while other assets will be made available a few days after that. The journalists will be free to write about anything from the presentations. They will also be provided with new screenshots and artworks. We will also make video material available, but this will differ from the material that the journalists got to see. The reason for that is simply that the material shown to the press may not be suitable for public consumption, as the video works best in a presentation setting and not necessarily as a downloadable video without that same context. It works in this setting, where we’re showing it on a monitor with Ragnar standing in front of it describing what they’re seeing. Just putting that out, in an unedited form, would most likely have a negative impact on our reveal. Sure, lots of the material we’re showing to the press will also be made public, but it will be edited into – as we said before the show – a different shape and form. As I’m sure you understand, when we are now finally putting out the very first in-game footage, we want it to be perfect and we want it to shine! We’re all extremely excited about this reveal, and as I said to Ragnar yesterday, it’s really difficult to wait until March 23rd before we can read about what the press thinks of what they got to see. Not to mention your reactions here on the forums! But we will all just have to be patient. I hope you will find it worth the wait! One day there will be a beta and I shall be in it. Mark these words. PQs? I do not haz them. I’m 100% totally uninterested in this game. The clincher on this one will be the PvP. PvE only gets me so far in a game. But it sounds like this is supposed to have some great stuff for PvP, so I’m crossing my fingers. Not that I’m going to avoid the PvE aspect of it, just that PvE in any game has a short longevity. Grinding to get the gear just to get into an instance is really dull for me. Even with PvP grinding for gear is pretty dull. But I was able to squeeze a good year of out of GuildWars playing the PvP competitive missions after I did as much of the PvE content as could hold my attention. Either way, I’m getting pretty excited about TSW. I’ve been curious about this game. It looks pretty interesting, I want to hear more about it before I get excited about another new game though. You couldn’t pay me enough to play enough game made by Funcom. The concept sounds great, I’ll admit. But given Funcom’s track record, it will ship with a huge number of bugs, then they’ll replace the director with someone who will decide to completely disregard the wishes of the current playerbase and instead “fix” things in such a way as to attract imaginary new subscribers. Rule #1 of Marketing: It’s cheaper to keep an existing customer happy than it is to bring in a new customer. I refuse to give money to a company that doesn’t understand the most basic rule of marketing…. It is my fondest hope that Funcom sell its assets to a competent gaming company and cease operations. Said competent gaming company should be sure to pick up many of the artists, writers, and engineers; conversely, they should be sure not to hire any of Funcom’s executives, for obvious reasons…. Jus’ an insubordinate observation… if you’re a member of a super secret society, do you *really* want to be calling attention to yourself the way these folks are doing? 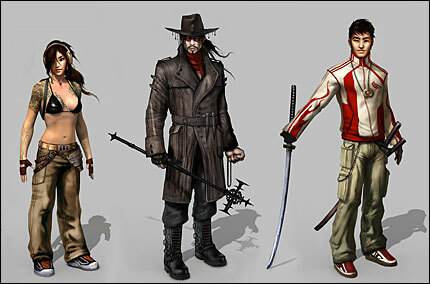 It’s pretty cool art (though the token chick is still strongly a “boys’ eye candy” sort of… thing), don’t get me wrong, but if I were someone who didn’t want to be seen by the world, well… I’d dress differently… and maybe not carry obvious weapons. I know, I know, that’s nitpickery, but at the same time, I do wonder if they will address that in the gameplay. What good is the whole “secret world” if all the little noob ganstas are advertising themselves out among the citizens? And if you’re only ever mucking around in the shadows, well… that’s a missed opportunity for storytelling, methinketh. Half the fun of secret spy stories is how the agents manage to go about their otherworldly duties whilst keeping the proletariats ignorant of their efforts. Really, that’s one way to stand out from the MMO crowd; make stealth and secret stuff part of the game, or else you’re just another fantasy three-faction M-rated romp with a veneer of modernity to be “different”. If the *gameplay* is more of the same, it’s just not going to be enough.